Since we’ve moved into the new house we haven’t made as as many pies as we used to. I guess we are still getting used to the space 🙂 This one was AWESOME! 1 Cup Kimchi (drained of liquid, pres with paper towel). 1/3 lb Sirloin sliced thinly (helps to freeze slightly before slicing). 10 oz Mozzarella cheese, (I use slices of fresh mozz). Add sea salt, olive oil, and 2 1/2 cup flour. Attach bowl and dough hook, turn to speed 2 and mix 1 minute. Continuing on speed 2, add remaining flour, 1/2 cup at a time, until dough clings to dough hook and cleans sides of bowl. Knead on speed 2 for 5 minutes. If making 2 pies split dough into 2 balls. Knead until the edges of bowl are clean, this may take more flour or more water. Cover, let rise in warmest place in house away from draft until doubled in bulk (about 1 hour). Punch dough down each ball. Marinate sirloin in fish sauce and ponzu for 1 hr. Then cook in skillet until browned and done. Once dough is ready. (Par baking is optimal), spread a very thin layer of Sirracha on pie, then add mozzarella, cooked sirloin, then cheddar cheese. Bake until cheese is melted and bubbly, about 10-15 min. 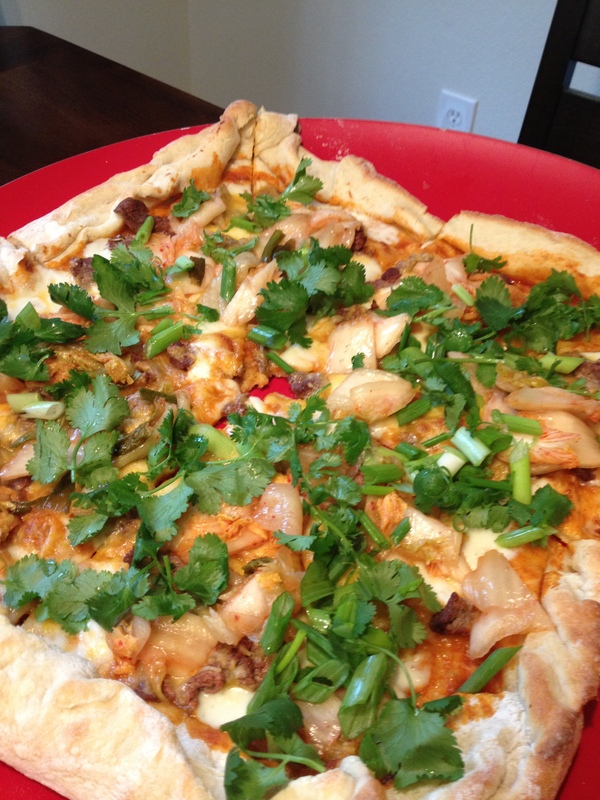 Add drained kimchi, cilantro, and green onion to top of pie. Check it out! Show some LOVE! Here is a peak into some food that’s been made in the ZestyBeanDog kitchen lately! Enjoy! 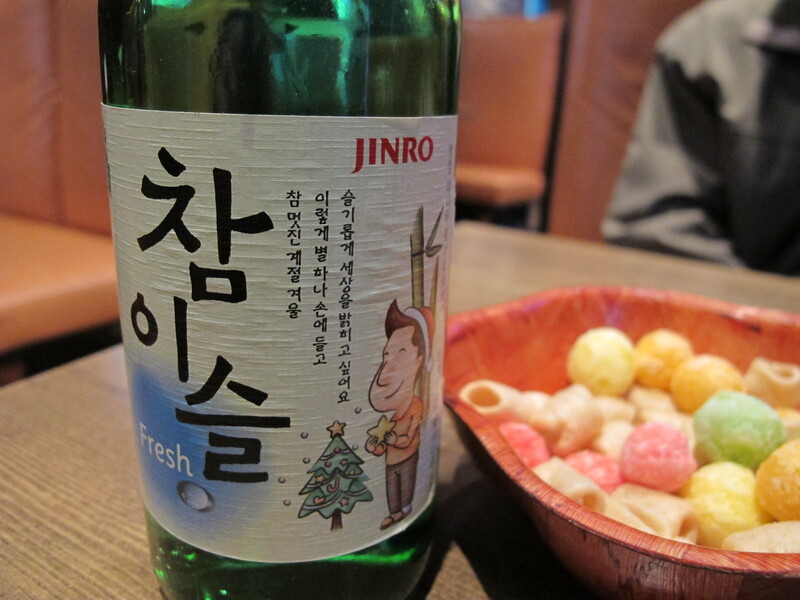 I love this stuff, yes kimchi…call me crazy, I don’t care! While kimchi is actually quite healthy, in this dish it’s transformed into a whole new sinful concoction once you add fries, ribeye meat, a TON of cheese, and chipolte mayo. If this dish were calorie free and fat free, well I might just eat this every day… for now I will refrain and just indulge when I’ve had 1 too many (thanks for being there Chilantro) or when Evan begs me to make them on a Sunday (usually he doesn’t have to beg to hard for these things). 1/2lb of thinly sliced ribeye or strip meat, the butcher can do this for you or you can freeze the steak for 30-45 min and slice it yourself with a SHARP knife. AKA bulgogi. Chop produce and slice meat if doing your self, throw meat in a bowl with the soy sauce. Heat skillet for cooking beef on high. Heat oil as directed on bag of fries and deep fry for specified time. Cook meat, it will cook quickly since it’s so thin. 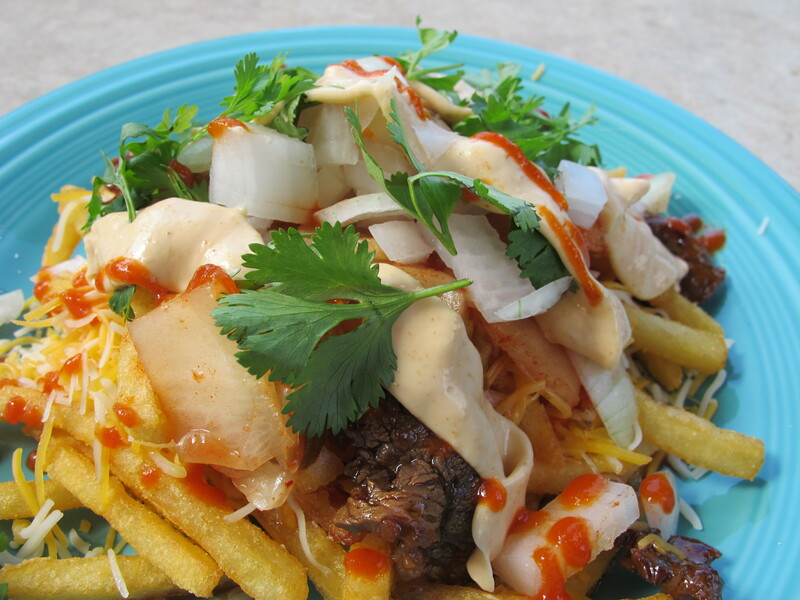 Make two mounds of fries, put cheese on top of fries, then beef, then kimchi, onions and cilantro, mayo and sirracha ( you don’t have to do it in this order but there is a method so the cheese melts). Serve with ice cold beer and enjoy! Cheers or should I say Gun Bae! 1/2lb-1lb Top Sirloin (marinated in soy, ginger, garlic, and green onion). Partially frozen, so it’s easy to slice thin. Slice then marinate. 2 C. Daikon radish, sliced into “sticks”. 2 C. Carrots, slided into sticks. 2 C. Zucchini (1 large Zucchini will do). Cook rice as directed, while rice is cooking cut up produce accordingly. Cook partially frozen sirloin in large skillet until done. Set aside. Once rice is done assemble bowls: rice on bottom veggies circle the top in 5 sections. Cook duck egg to your liking, I like both of my sides cooked for about 2 min on each, Evan likes just one side cooked for about 1.5 min. Cook egg on medium high on a non stick skillet. Place egg on top of veggies. Well sorry for the slight delay in posting, we’ve been very busy! 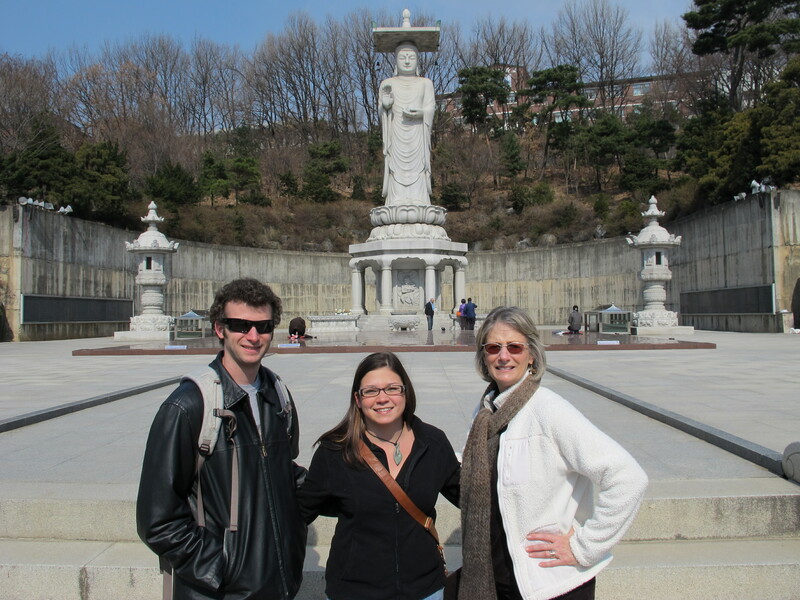 We’ve had a fantastic time eating, sightseeing, and even with our LUCK! I’ll briefly touch on all of these and then I’m off to visit a palace! 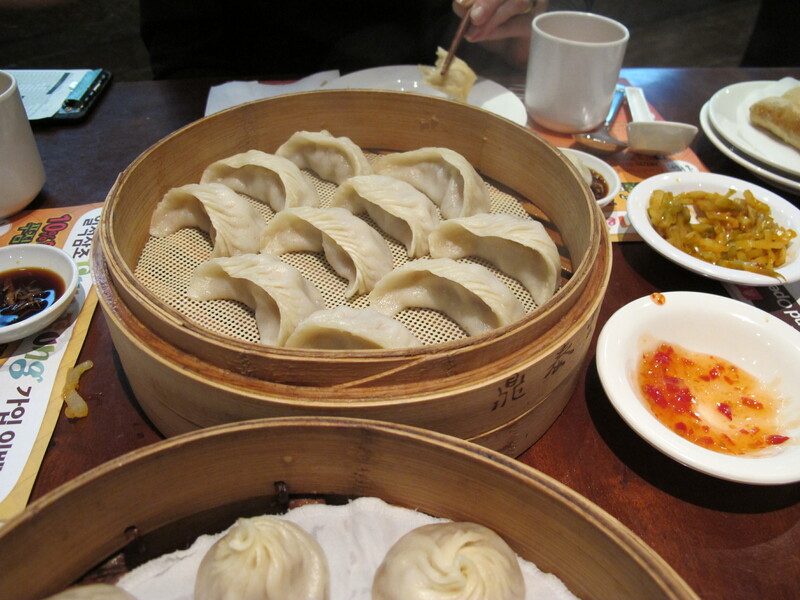 We went to a place called Din Fung for dim sum and had plenty of soup dumpling, regular dumplings, kimchi (it’s served with every meal), sauteed baby bok, and tea. 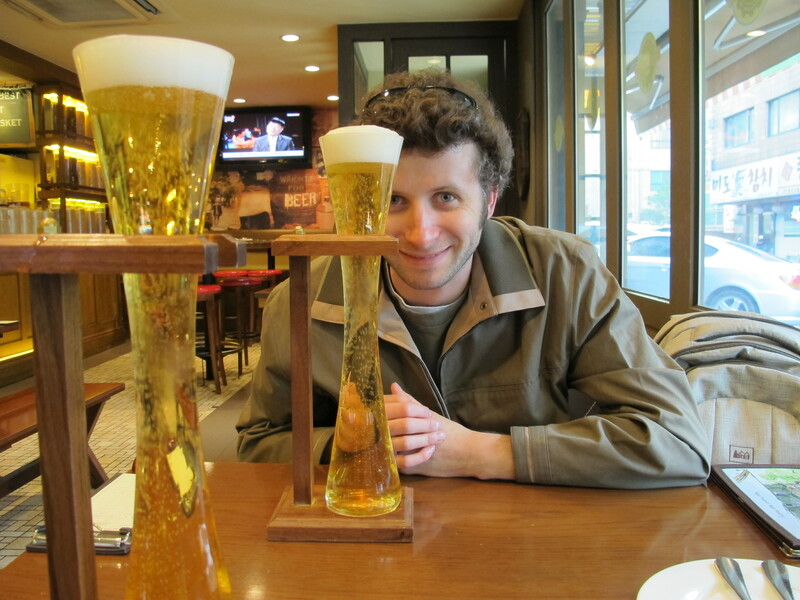 It was all very good and 100 times better than anything in America! 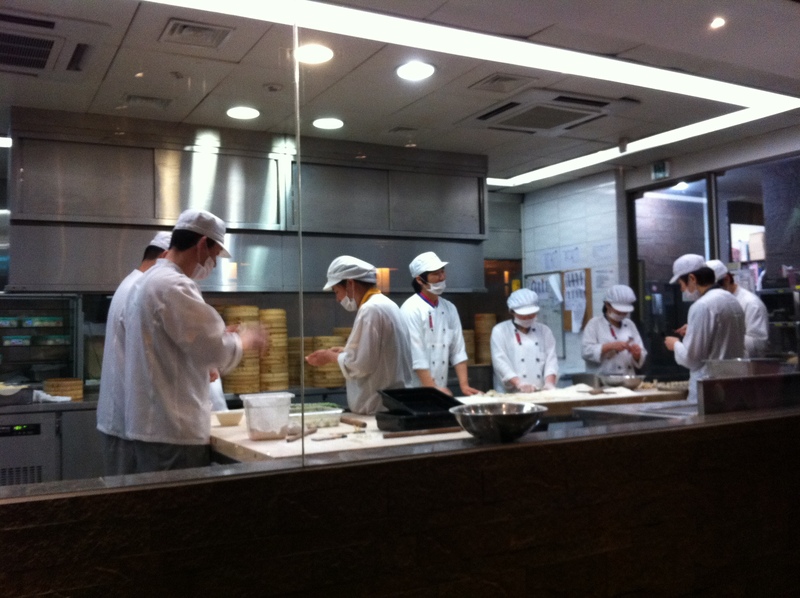 They also hand made all of the dumplings and noodles in a kitchen you could see in while eating so that was really cool! 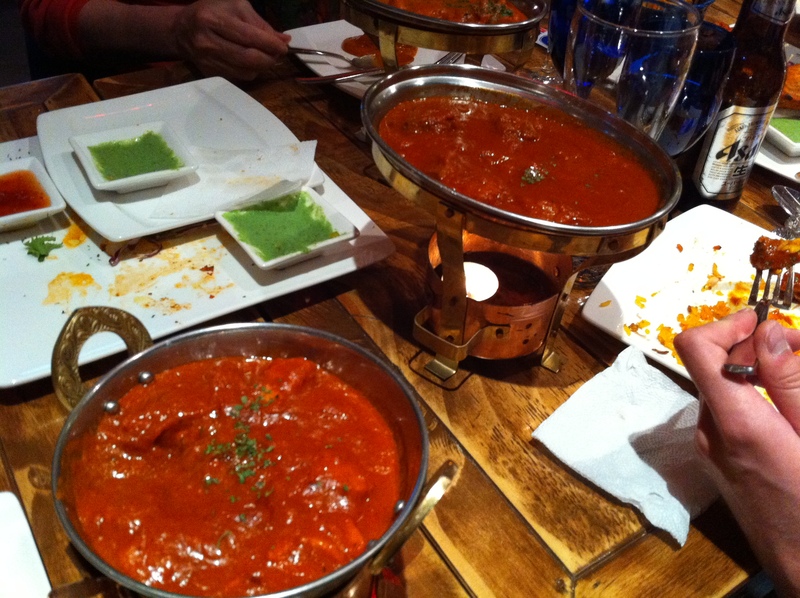 Then we had Indian at Asia Luna, all very good at SPICY! (this is where I discovered that the Men’s and Women’s restrooms in public are in the same room…). 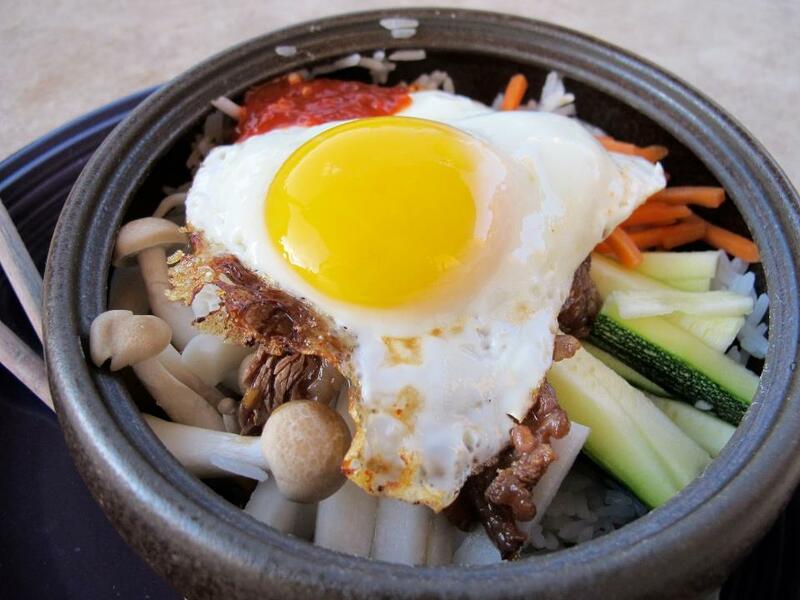 The word literally means “mixed meal.” Bibimbap is served as a bowl of warm white rice topped with namul (sautéed and seasoned vegetables) and gochujang (chili pepper paste). 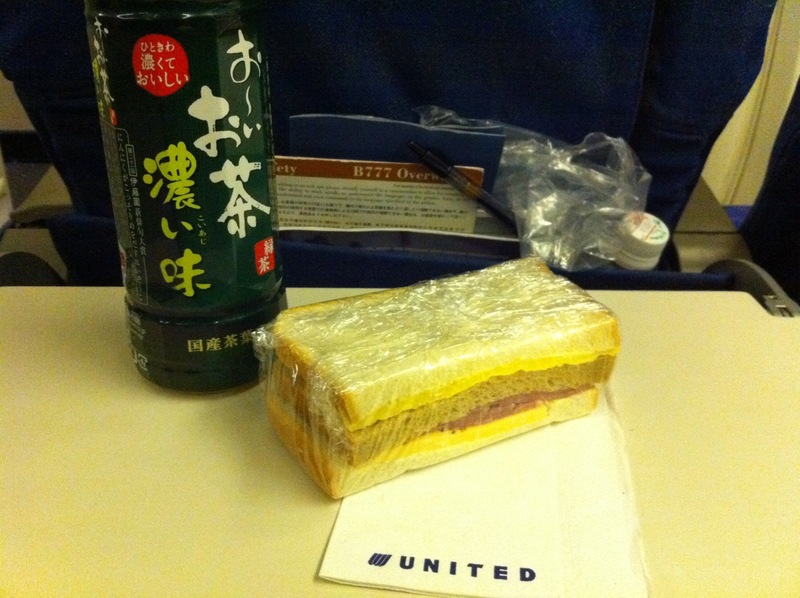 A raw or fried egg and sliced meat (usually beef) are common additions. The ingredients are stirred together thoroughly just before eating. It can be served either cold or hot. Bulgogi (Korean pronunciation: [bulɡoɡi]) is a Korean dish that usually consists of marinated barbecued beef, although chicken or pork may also be used. 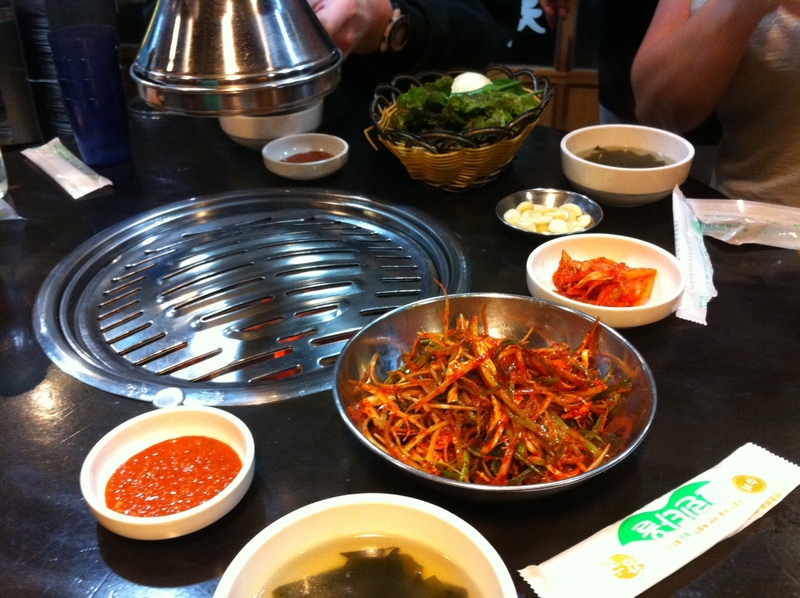 This was typical Korean fare an very tasty!!! I really liked this a lot and was anxious for my first real Korean dish! The one thing I really love so far about Korean fare is everything comes with sides and different sauces. 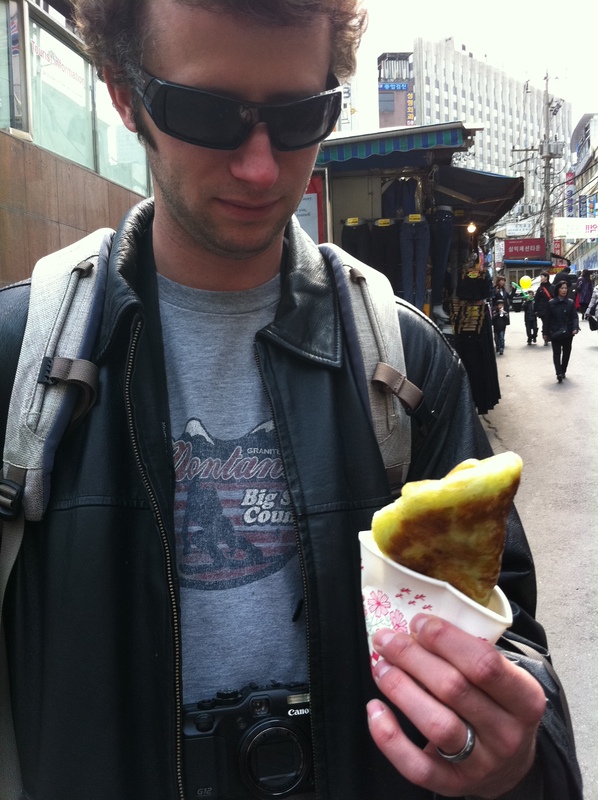 Ho-tteok is a variety of filled Korean pancake, and is a popular street food of South Korea. It is usually eaten during the winter season. It was very sweet. Kimbab, which is like sushi rolls but with veggies and a minimal amount of meat and some other things I have no idea what they were…(sorry no picture, I forgot). 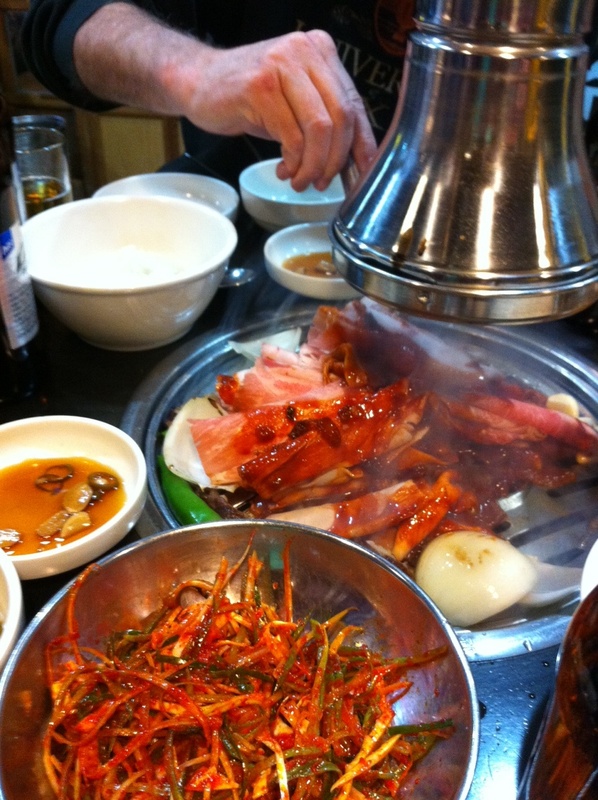 We also had Korean BBQ: which was awesome! We had pork and beef, both equally good! You cook it up yourself and then dip it in the according sauces, all served with several sides of course! EVERYONE here was smoking and drinking Soju, we were the last people that made it in then they started turning people away because they were “full”. Apparently in Korea there’s no “waiting” for a table even though they seem to “wait” for EVERYTHING else… especially subways! While I’m on the subway topic, if you like your “personal space” you absolutely DON”T have it in Korea, think sardines and then throwing another 20 in the same can! You’re lucky if you get in and even luckier if you can get off at times. Every once in a while we would get a seat but not often. Out of 25 million Korean’s- it feels like probably 99% take public transportation to get around. The Bongenus Temple, Namdaemun Market, The Express Bus Terminal (loads and loads of shopping), Nseoul Tower, The National Museum, Insadong artsy area, The Coex, and more. I will go into more detail later on these… Now for the LUCKY ODDS part! I looked this stat up and from what I found 5.6 million people use this subway on average a day, wow! It’s almost nauseating how many people are running around all the time! Well yesterday we were heading home on the Subway and we happened to run in to an old friend from San Marcos that we knew when we were in college, she used to date my old roommate… We had joked several times: “I wonder if we will run into Kay?” WELL… we did! It was absolutely amazing! We were in total shock! 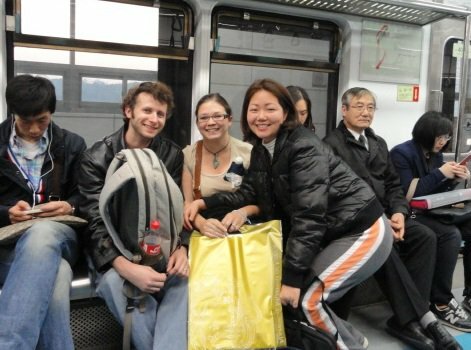 Seoul’s subway is the 3rd largest in the world! We’re meeting up with her next Thursday! We leave for Thailand tomorrow! Stay tuned!